Birdwatching was made for Costa Rica. 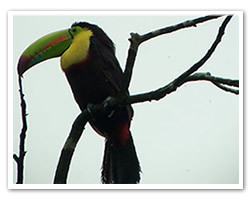 The toucans, aracaris thecommon paquares and hummingbirds are always at Mar y Selva Ecolodge -Costa Rica- and the sounds of other birds abound. Nearby there are guided bird watching tours and if you go to the Tres Hermanas Islands by kayak, you will find that many sea bird colonies use this as their nesting grounds year round. La Merced Wildlife Refuge is located on the Pacific Coast of Costa Rica near Punta Uvita and the Ballena Marine National Park, in the Costa Ballena area. The refuge has an area of 1,250 acres which is comprised of a forest reserve with both primary and secondary tropical wet forests as well as pasture, a mangrove estuary, frontage on the Morete River and a beach. It offers a wide variety of habitats to explore. A nocturnal walk is also available and may produce sightings of the Spectacled Owl, the Crested Owl, the Black and White Owl, and the Common Paraque. Explore the rainforest trails of this nature reserve where countless birds will be spotted in the abundant mixed flocks. Hike through the lower areas to see birds from more open areas and sea shore. You will find birds like Tawny-winged Woodcreepers, King Vultures, Red-capped Manakins, Streaked-chested Anpitta, as some of the permanent inhabitants. This National Refuge has 815 acres of land that covers a large variety of habitats, from wetlands and secondary forests in the lowlands to primary forest on the highland coastal ridge. It has 7 km of walking trails for bird watchers. Bird watching tours are their specialty. 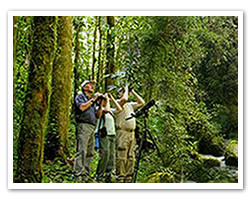 Their excellent naturalist guides will help you discover the wonders of the tropical rainforest. It ranks third in the top five national parks of the world. According to National Geographic Magazine, it also holds 4% of the entire world's biodiversity. It is home of the largest population of scarlet macaws in the country and it is home of almost 400 species of birds including the horned guan. 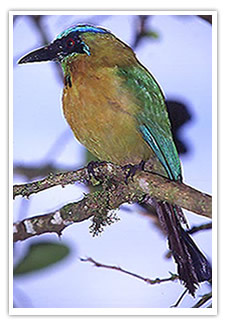 The region is within the Southern Central American Pacific Slope Endemic Bird Area which has 16 restricted-range species. At least 9 of them occur on the Osa Peninsula, of which the mangrove hummingbird (Amazilia boucardi) and yellow-billed cotinga (Carpodectes antoniae) are considered globally threatened and three others nearly threatened (Stattersfield et al., in press). There are six natural eco-systems and it protects endangered species such as the jaguar, puma, crocodile, tapir, poison dart frogs and the Harpy eagle. The forest also holds a great amount of exotic and endemic plants and insects that provide valuable information to the scientific and medical research communities. It is the best place to catch a glimpse of the diverse wildlife that exists in Costa Rica and the best place for bird watching!